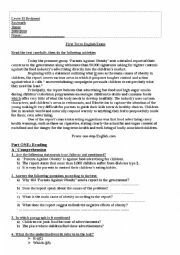 An exam about child obesity and the impact of advertising hope it´s useful and interesting as it was for my pupils! Have a nice day! Hi! This is an exam meant for the 3rd year students in Algeria, the topic is child labour. It contains 2 main parts: Reading and writing. I hope you find it useful for you and your pupils. Have a nice day!! Hi!! 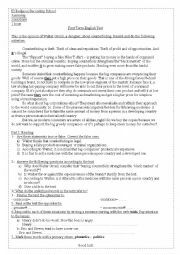 Another worksheet, this time it is a test I gave my pupils last year, the main topic is about charities, the text is taken from pupils´ textbook, I summarized it to fit the timing. I hope it´s useful for your pupils! have a nice day! 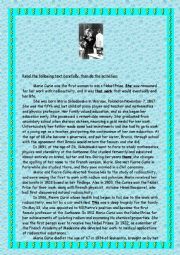 Hi dear colleagues, This is the biography of Marie Curie, I prepared it according to the Algerian syllabus, unit 3: Education I hope you like it and find it useful! Have a nice day! 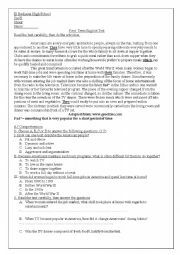 Salem/ Hi everyone, I would like to share with you the exam I gave my pupils in the first term. 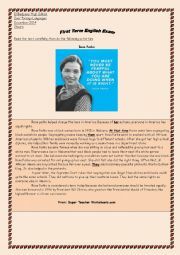 It deals with the topic of racism and the great personality of Rosa Parks. The exam is designed according to the Algerian examination system. I hope you like it and find it useful. Have a nice day. 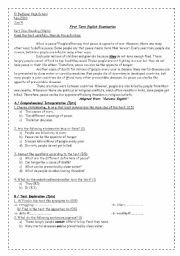 Good morning, this worksheet is an exam I gave my 3rd years classes concernig the unit: Feelings and Emotions. It contains two main parts: Reading and Writing. I hope you find it useful! Have a nice day! 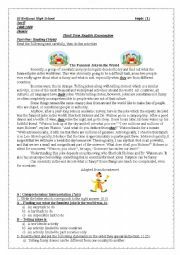 This is a test that deals with the problem of counterfeinting hope it´s useful and you like it Have a nice day! Hi, dear colleagues, This is a test for 2nd year the Algerian SYllabus. I took this text from their book. It is an additional text given at the end of the unit. I adapted it and give it as a test. 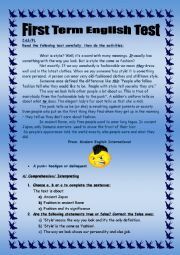 I hope you find it interesting and useful Have a nice day!